El Niño has kicked off with an audacious display in the Southwest. In mid-October, rainstorms rocked California’s southern desert for nearly a week, rivers flowed across the Mojave, and Death Valley--the driest place in North America--filled with water (pictured above). There is a lot of hype surrounding this year’s El Niño and the outlook for weather, especially after an outrageous fire season in the Northwest and persistent drought in California. For all us outdoor enthusiasts there is the lingering question: what does it mean for snow this winter? Winter recreation will indeed be impacted. We can predict some of what may happen, but there are always unknowns with El Niño. This climate phenomenon stirs such a buzz because so few people really understand where “The Little Boy” comes from and what he is capable of. He’s a mischievous lil’ fella born in the warm waters of the Pacific who pays a visit every few years to meddle with ocean temperatures and wind currents. The rest of the world has no choice but to play along with his rambunctious game as global climate gets tossed around in complex, yet predictable, swings. Here’s a look at what El Niño really is and what it means for getting in on the fun this winter. Continue reading for a summary of the science and how it all works. Though scientists are still trying to figure out the intricacies of this complex phenomenon, there is enough data to predict general impacts, which vary by region. For the most part, El Niño brings warmer and drier than average winters to the Northwest along with cooler and wetter winters to the Southwest. The strength of these effects vary each time El Niño comes around, and sometimes they are hardly noticeable. This winter we have a good chance of noticing them. Here’s what to expect. British Columbia, Washington, and northwest Oregon have the greatest chance of above-average temperatures, and the probability is pretty high for Nevada and every state north of Colorado. All of California will probably receive temperatures that are warmer than normal, especially the northern part of the state. Arizona, southern Utah, Colorado, and a band of states to the east have an equal chance for warming or cooling. New Mexico and Texas eastward will likely be colder than normal. The area with the greatest chance for a drier winter is western Montana, and surrounding areas may experience the same. The Pacific Northwest Coast has even chances of receiving a wetter or drier winter, as do central Utah and northwestern Colorado. Areas expected to get more precipitation are central and southern California (thank goodness) and the rest of the Southwest. If you live in the Northwest, expect winter conditions to be less predictable than normal. A combination of warmer temperatures and drier air means that good snow may be harder to find. Higher elevations are more likely to retain the goods, but plan on a thinner snowpack going into the spring, especially in Montana and Idaho. This is bad news for next year’s fire season, so be extra cautious with open flame come summer. Utah straddles the midline between predictions, so the outlook is less certain. Salt Lake City and the Wasatch are leaning toward warmer and drier conditions. California will hopefully get some much-needed rain, though the amount is not expected to pull the state out of its drought status as defined by multi-year precipitation averages. Because the region will likely be warmer than normal as well, look to higher elevations for good snow. The rest of the Southwest should receive some hydration as well, though the drought has been less intense outside of California. Arizona, New Mexico, and Colorado skiers and snowboarders should be hopeful that above-average precipitation coincides with just the right temperatures to make a good snow season. Keep in mind that scientists talk about all these things in terms of probability, meaning nothing is for certain. Also, the actual amount of temperature or precipitation change in any given area will vary greatly with localized weather patterns, so keep an eye on your local forecast as always. Obviously our knowledge is limited, but there is a lot we do understand about El Niño, which is a naturally-occurring climate cycle. Scientists call this phenomenon El Niño Southern Oscillation (ENSO), so named because it is a periodic flip-flop of ocean surface temperatures in the equatorial Pacific. When temperatures are above average, it creates warm seawater, rising air, and strong winds on the South American west coast that cause ripple effects in ocean and air currents throughout the Pacific and surrounding land masses. Most important for North America is what happens to the jet streams, which are high-altitude super highways of moving air that undulate from west to east over the continent and drive predominant weather patterns. There are two main branches of jet streams, northern and southern. During El Niño, the northern branch takes a big northward curve to push cold air and ocean moisture further into Canada, leaving the Northwest U.S. warmer and drier. At the same time, the southern branch straightens out and rips right across the Southern U.S., channeling cool, wet weather from low-pressure cells in the Pacific. The two branches then converge over the Northeast U.S. where they tend to whip up winter storms. All these impacts stem from a warmer-than-average Pacific Ocean near the equator, which is known as the El Niño phase of ENSO. Cooler-than-average temperatures create largely opposite effects on climate and are called La Niña. Each phase typically lasts between 9 and 12 months, but the same ENSO phase can recur up to four years in a row. Any given year is said to be in one phase or the other, with average temperatures simply being the midline between the two. The magnitude of warming or cooling varies with each cycle, so some years are said to be stronger than others. 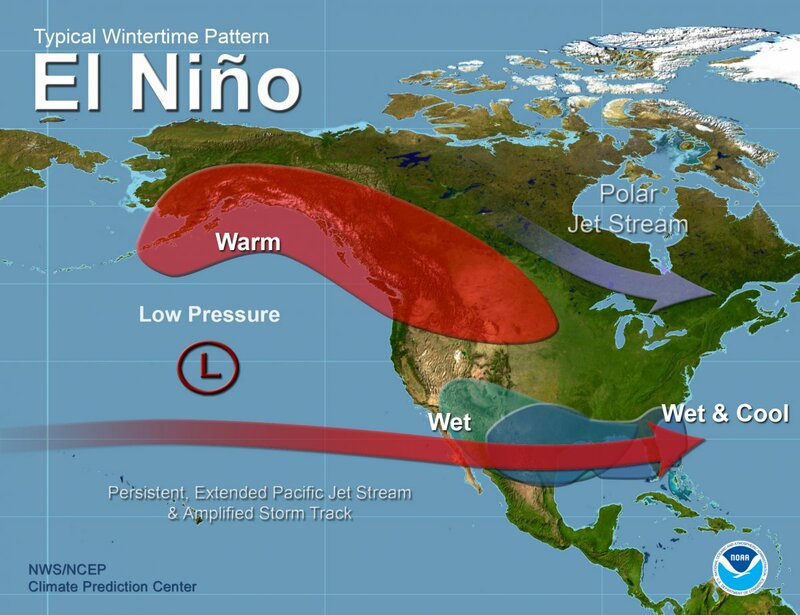 The siblings each have their own noticeable effects on global climate, but El Niño tends to be more dramatic for weather in North America, especially winter weather. So if it happens all the time, what’s special about this year’s ENSO phase? Measurements show that Pacific Ocean temperatures right now are well above the threshold of what is considered a strong El Niño warming, but the specific cause for this year’s strength isn’t entirely known. What’s more, ENSO is not the only climate cycle that comes into play. The Pacific Decadal Oscillation and the Interdecadal Pacific Oscillation are two similar phenomena that operate on longer timescales than El Niño, and their mechanics are even less well understood. It is possible that their cycles are converging on this year’s ENSO to magnify El Niño, but it’s uncertain. The last time we saw early indicators of this strength was in the fall of 1997, preceding a record-breaking El Niño. The winter of 1997-98 brought severe flooding in California and the Southeast U.S., tornadoes in Florida, and deadly ice storms in New England and Canada. This year, there's already been a huge hurricane in the Pacific. It is important to note, however, that no two El Niños are ever exactly alike because of influence from other climate cycles and localized weather variability. Hopefully this winter we can enjoy all the benefits of extra water in the Southwest and a more comfortable winter in the Northwest without suffering more on account of El Niño. With proper knowledge of what weather to expect, we can plan safely and make the most of a potentially wild winter. So get out there and adventure.